Vedic mathematics for Schools, Book 2 is intended as a first year textbook for senior schools or for children aiming for examination at 11+. It is based on the fundamental principles of Vedic mathematics which were reconstructed earlier this century by Sri Sankaracarya Bharati Krsna Tirthaji. Although the sutras may well be very ancient, Practice and experience have shown that they are highly relevant and useful to the modern-day teaching of mathematics. They are entirely applicable to modern problems and even to Modern approaches to mathematics. Topics covered includes the four rules of number, fractions and decimals, simplifying and solving in algebra, perimeters and areas, ratio and proportion, percentages, averages, graphs, angles and basic geometrical constructions. The book contains step-by-step worked examples with explanatory notes together with over two hundred together exercises. The material in this book is currently used at schools around the world associated with the Education Renaissance Trust. 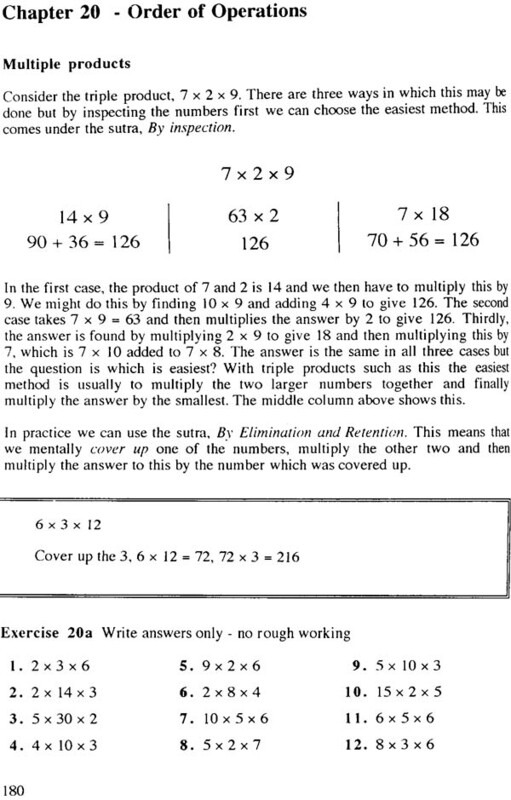 It is assumed that pupils using this book already have a degree of mathematical ability. In particular, the time tables need to be fully established. 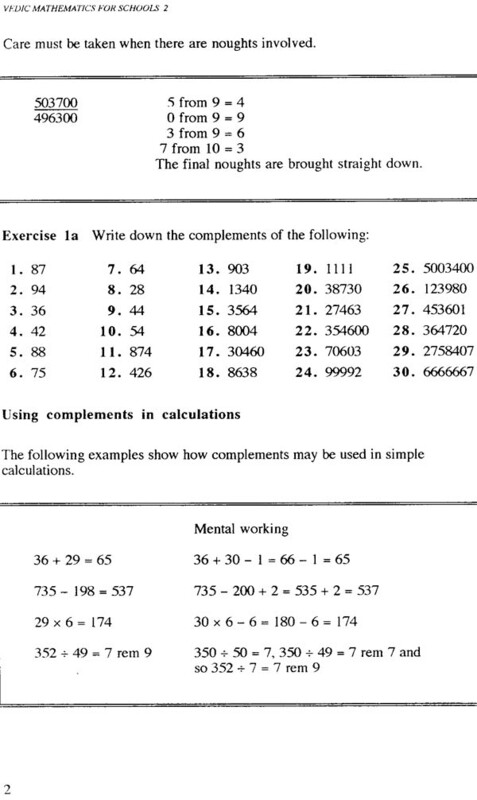 It should also be stated that regular practice of mental arithmetic is an essential accompaniment to this course. Each method used for numerical calculations is introduced separately and exercises are carefully graded to enable the distinct developmental steps to be mastered. Each technique is denoted by one more of the sutras. The text incorporates explanations and worked examples of all the methods used and includes descriptions of how to set out written work. The structure of the book is such that at the end term a bright pupil should be able to complete about eight chapters. 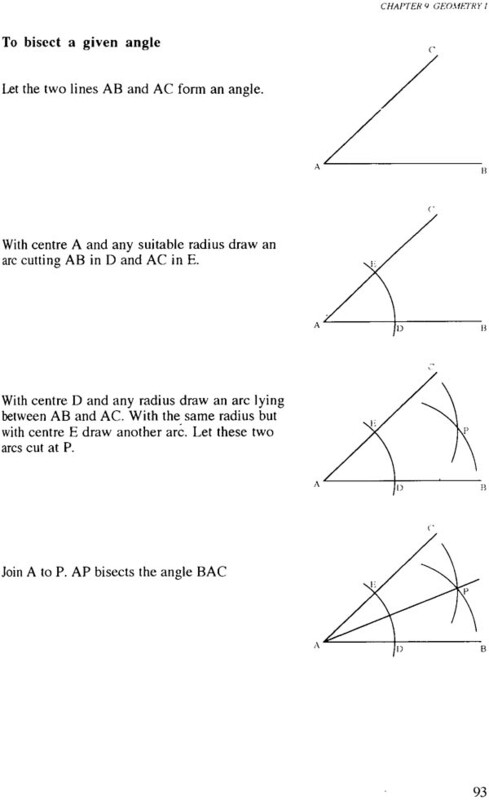 There are three revision chapters, the last of which contains practice papers. It is not necessarily intended that teachers rigidly adhere to the order of chapters as presented. Nevertheless, there are certain topics that the should be covered before moving on to more advanced work. The course has been written in conjunction with teaching a group of ten and eleven year-olds. The main emphasis at this stage is on developing numeracy and its principal fields of application, since this is the most essential aspect of mathematics. 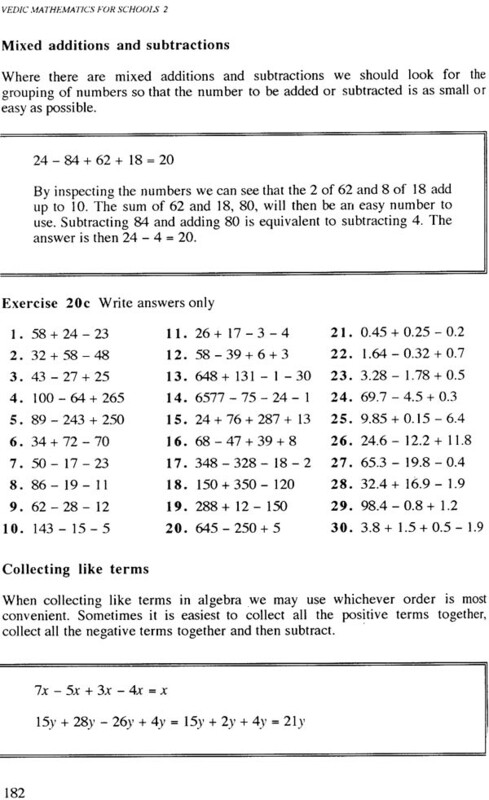 The text concentrates on these areas of mathematics and treats them as the core curriculam of the subject. Experience has shown that children benefit most from their own practice and experience rather than being continually provided with explanations of mathematical concepts. The explanation given in this text show the pupil how to proactive so that they may develop their own understanding. It is to be hoped that teachers may provide their own practical ways of demonstrating this system or of enabling children to practice and experience the various methods and concepts and concepts, of course, where teachers are unfamiliar with the system themselves they would also have to practise. It is difficult to appreciate the full benefits of Vedic mathematics unless one gets immersed in the techniques, leaving behind all previous personal paradigms and prejudices about mathematic. James T. Glover is head of mathematic at St. James Independent Schools in London where he has been a teacher for eighteen years. He is director of mathematical studies at the School of Economic Science and a Fellow of the Institute of Mathematics and its Applications. He has been researching Vedic mathematics and its use in education for more than twenty years and has run public courses in London on the subject. 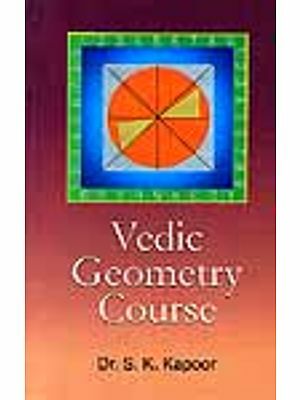 Other books by the author are: An introductory Course in Vedic Mathematics. Vedic Mathematics for Schools, Book I and Foundation Mathematic, Book 1, 2 and 3. 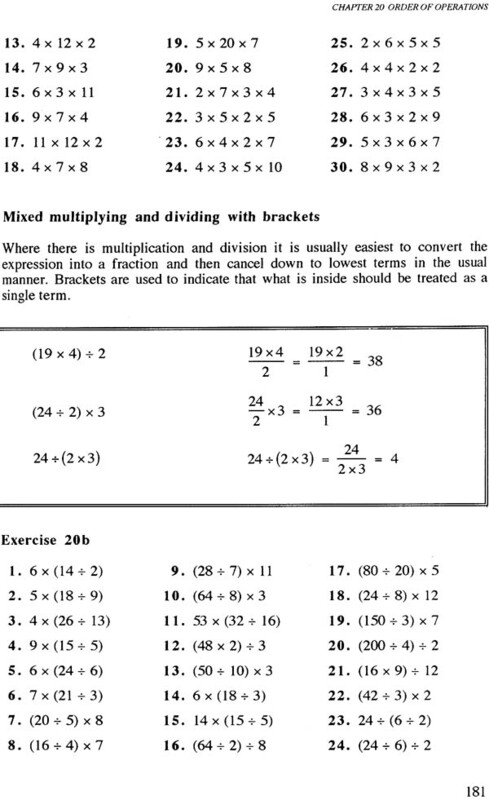 Vedic Mathematics for Schools is an exceptional book. It is not only a sophisticated pedagogic tool but also an introduction to an ancient civilization. It takes us back to many millennia of India’s heritage. Heritage Rooted in the ancient Vedic sources which heralded the dawn of human history and illumined by their erudite exegesis, India’s intellectual, scientific and aesthetic vitality blossomed and triumphed not only in philosophy, physics, ecology and performing arts but also in geometry, algebra and arithmetic. 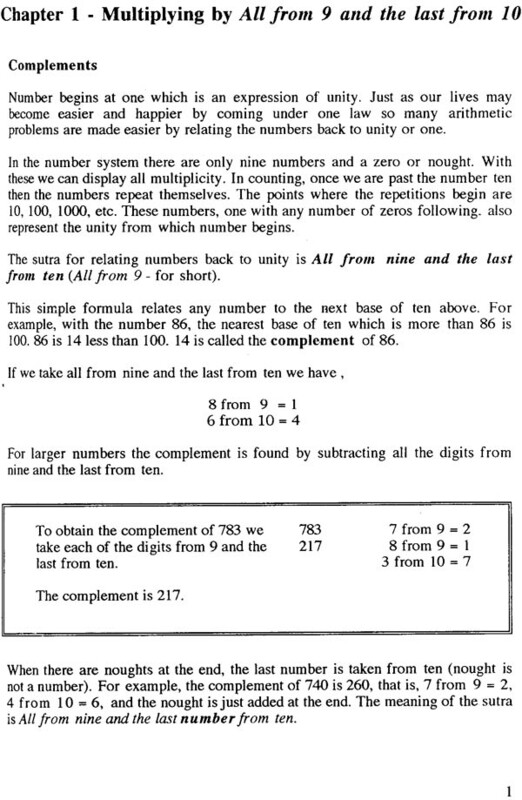 Indian mathematics gave the would the numerals now in universal use. The crowning glory of Indian mathematic was the invention of Zero and the Introduction of decimal notation which mathematics as a scientific discipline could not have made much headway. It is noteworthy that the ancient Greeks and Romans did not have decimal notation and, therefore, did not make much programs in the numerical sciences. The Arabs first leant the decimal notation from Indians and introduced it into Europe. The renowned Arabic scholar. Alberuni or Abu Raihan, Who was born in 973 A.D. and traveled to India, testified the Indian attainments in mathematics were unrivalled and unsurpassed. In keeping with that ingrained tradition of mathematics in India, S. Ramanujan, “the man who know infinity”, The genius who was one of the greatest mathematics of our time and the mystic for whom “a mathematical equation had a meaning because it expressed a thought of God”, Blazed many new mathematical trails in Cambridge University in the second decade of the twentieth century even though he did not himself possess a university degree. The real contribution of this book, Vedic Mathematics for Schools, is to demonstrate that Vedic mathematics belongs not only to hoary antiquity but is any day as modern as the day tomorrow. What distinguishes it particularly is that it has been fashioned by British teachers for use at St James Independent Schools in London and other British schools and that it takes its inspiration from the pioneering work of the late Bharati Krishna Tirthaji, a former Sankaracharya of Puri, who reconstructed a unique system on the basis of ancient Indian mathematics. The book is thus a bridge across centuries, civilizations, linguistic barriers and national frontiers. Vedic mathematic was traditionally taught aphorisms or Sutras. A Sutra is a thread of knowledge, a theorem, a ground norm, a repository of proof. It is formulated as a proposition to encapsulate a rule or a principle. A single Sutra would generally encompass a wide and varied range of particular applications and may be likened to a programmed chip of our computer age. There aphorisms of Vedic mathematics have much in common with aphorisms which are contained in Panini’s Ashtadhyayi, that grand edifice of Sanskrit grammar are built the foundations of rigorous logic and on a deep understanding of how the human mind works. The methodology of Vedic mathematics and Sanskrit grammar help to hone the human intellect and to guide and groom the human mind into modes logical reasoning. I hope that Vedic Mathematics for Schools will prove to be an asset of great value as a pioneering exemplar and will be used and adopted by discerning teachers throughout the world. It is also my prayer and hope that the example of St James Independent Schools in teaching Vedic mathematic and may eventually be emulated in every Indian school. 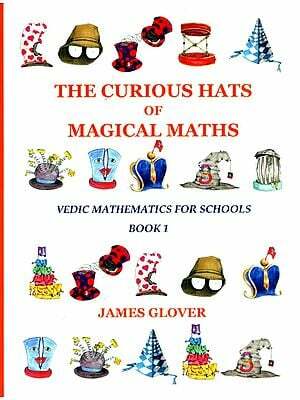 Vedic mathematics for Schools Book 2 is a text for the first-year at senior school. Book 1 of the series is for primary schools and does not have to be read first since each of the methods in the present work are introduced from their inception. These books are based on the fundamental ancient Hindu system which used few simple rules and principles which in Sanskrit are called sutras. The sutras enable fast and easy methods of calculation. This system of mathematics was recreated by the late Sri Bharati Tirthaji (1884-1960) a brilliant scholar and exponent of the spiritual teachings of the Veda (he held the seat of Sankaracharya of Puri for many years). The Vedas are ancient texts of India written in Sanskrit. They are concerned with both the spiritual and secular aspects of the life because. In that time, no essential difference was perceived between the two. The Veda deals with many subject but the texts are frequently difficult to understand. Tirthaji made great efforts to dig out the system of mathematic from these texts and came up with sixteen sutras and about thirteen sub-sutras. A sutra is a pithy statement containing a governing principle, a method of working and the ones which he discovered relate to mathematics. Not long before he died, Trithaji wrote an illustrative volume on the subject entitled Vedic mathematics which was published posthumously in 1995 (Motilal Banarsidass, Delhi). Sri Tirthaji applied the sutras to the mathematics of his day and so in his book we find a good deal of arithmetic and algebra. It has since been shown that the system is equally applicable to more up-to-date aspects of mathematics both at an elementary level as well as in more sophisticated fields. The reason that this is possible relies on the nature of the sutras. They frequently describe how the mind approaches, or deals with a problem in the easiest way. To take a very simple example, consider the sum of 267 and 98. The blanket method involves cumbersome arithmetic. 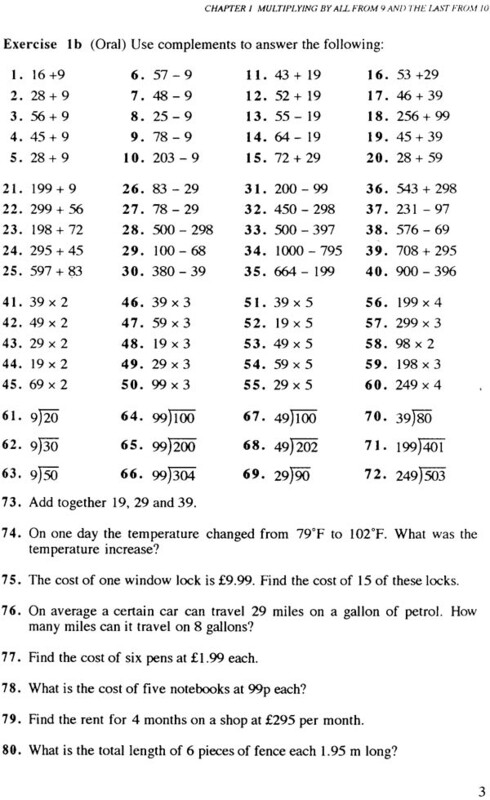 Most people would realize that the easiest method is to add 100 and take off 2. The answer of 365 is than found using a comple. The Vedic system teacher this sort of approach systematically rather then leaving it to chance and hence we find a number of different possible methods for any particular sum. This is of tremendous use because it enhances variety of strategy. It also enables the subject to be kept alive by the attention towards underlying pattern and relationship. Of course, with children, some mastery of the different method must be accomplished before this more creative approach can be adopted. The sutras, which are used in translation in this book, provide easily remembered word-formulae for saving problems in arithmetic, algebra, geometry and their various applications. The methods are fast and effective because they rely on mental working. 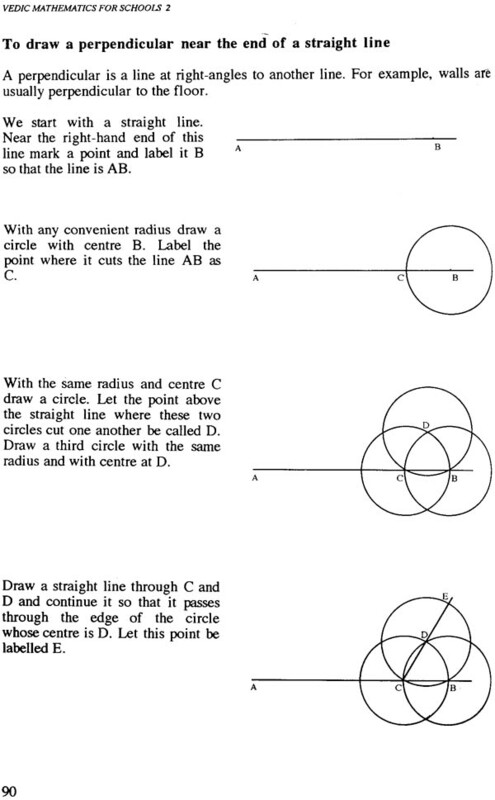 In many applications answers are found in one line and for this reason the mathematics can often appear to be intuitively based. Nevertheless, it is all quite logical and systematic. In the United Kingdom there the growing Singh of dissatisfaction with the lack of training in numeracy and the accompanying degeneration of algebraic and other mathematical skills. Some would argue that is due to missed educational methods whish others lay blame on the widespread use of electronic calculating aids. During this century, the treatment of mathematics in education has seen a decline in rigor and, more recently, a move away from the so called ‘drudgery’ of sums. Vedic Mathematics for Schools aims at providing a good mathematical training without the necessity of relying on calculating aids. It also aims to relate mathematics to the natural laws expressed in the Vedic sutras. As with the boys, exercise and training are required to develop health, strength, agility and skill, do too with the young mind, training is required for development of knowledge, creativity and the ability to reason. Mathematics and, in particular, the experience of working with number, provide one of the powerful tools to accomplish this. For this purpose, these Vedic methods are used for basic numerical skills. Not only are they enjoyable, but they also encourage the use of mental arithmetic. For example, there are method which replaces long multiplication and division whereby the answere to any such sum can be obtained in one line. Experience of teaching these methods to children has shown that a high degree of mathematical ability can be attained from an early age while the subject is enjoyed for its own merits. I have received criticism that Vedic mathematics only provides a few interesting techniques and is not really relevant to a core curriculum. They have also been the comment that children do not understand these methods are merely tricks. None of these comments has ever come from anyone who has studied and practised the system but only from those who seem to be looking at it from the outside and therefore have little understanding. themselves. A soup packet has the name, cooking instructions and even a picture printed on the outside. Until the soup has been tasted, howere, there is only peripheral knowledge and certainly no basis from which to make a sound judgment. Nevertheless, in reply to the first criticism it has to be understood that in the Vedic system there are general methods for all calculations and algebraic manipulations, and also short easy ways for particular cases, for instance in multiplying or dividing number close to a power of ten. Where such particular methods are introduction at an early stage it is because they usually relate to more general aspects of the system at a later stage. The correct methods of calculating which have been adopted by most schools are ‘blanket’ methods and no short cut methods or even intuitive approaches, are systematically used. For example, with division only one method is taught and although it will suffice in all cases, it may often be difficult to use. The Vedic system in the book teaching there basic method for division which are applied to meet the particular case although each could be used for any division sum. 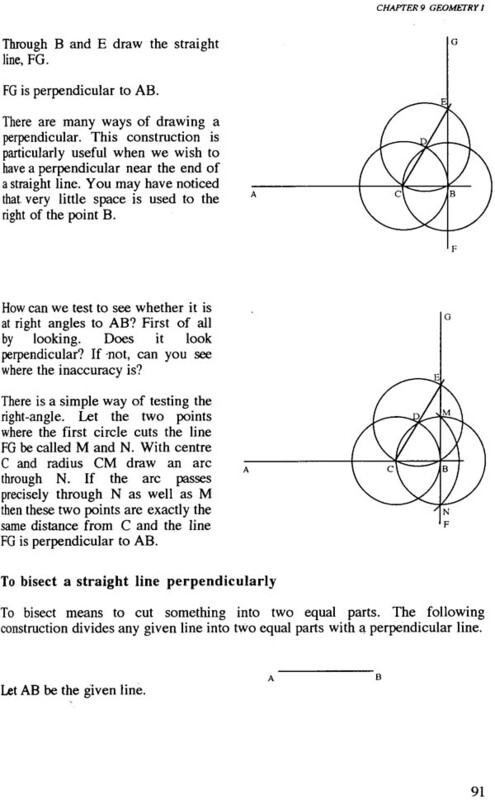 The second criticism raises an important issue in relation to school mathematics. 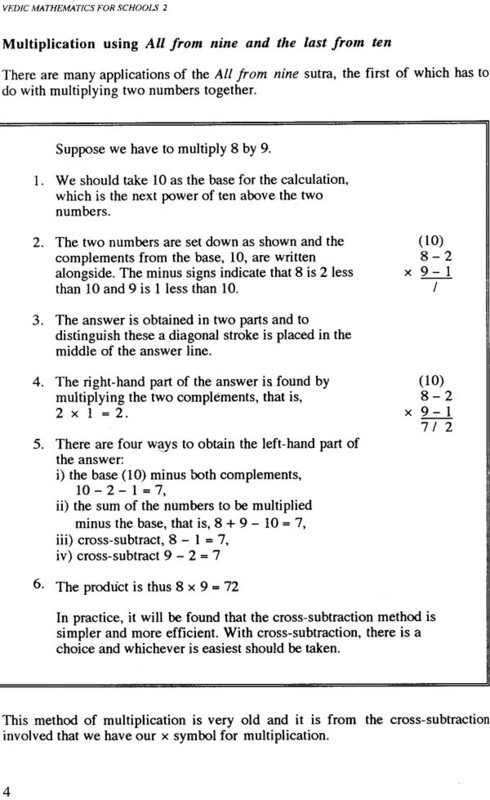 This concerns the use and understanding of set formulae to solve problems. There are many instance in education where in the student are rewired to learn a formula to solve a particular type of problem whilst not understanding the mathematics behind the formula. We could take as an example the well known formula used for solving questions equations, there are few who understand how it has been derived. The usual practice is to gain some familiarity with its application before learning how it arises. Another example which is even more stark concerns the formula for finding the volume of a pyramid with a polygonal base. The formula is Volume equals one third of the base times the perpendicular height and is leant quit early on in the school curriculum. 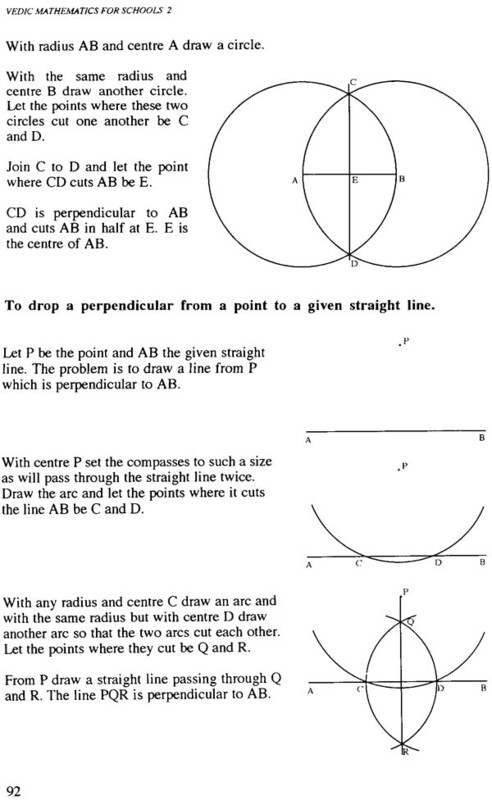 But to prove or derive result the student needs to be adept either in there dimensional geometry or in the calculus. The formula is simple but the derivation requires mathematics of a much more advanced character. Much of school mathematics is like and there is nothing amiss. When a student is faced with a problem which can be solved using a simple well-known formula then, by all means, it should be used. We accept the validity of such formulae on trust and that and it works is magical. The magic becomes mathematic when the formula is understood. Vedic mathematics appears, at first, to have a magical quality. When the methods are understood, particularly in reaction to one another, then it is unified mathematics. Mathematics is a practical science as it helps us with daily life. It also helps us to understand the mysteries of the universe. The study of mathematics may be seen as having two direction, an other an outer and an inner. The outer direction moves us to appling number, order and mathematical relationships in the world around us. It is practical, useful and beneficial. This includes the everyday activities of shopkeepers, accountants, technicians, engineers, scientists, etc., etc. In fact our lives, in the ordinary sense, would be very limited were it not for the applicability of number. This carries with it the responsibility of those with some understanding of the structure of mathematics to ensure that institutions are retained which enhance and disseminate mathematics as a structured body of knowledge.